TV cameras are becoming a regular sight in and around Leduc lately and March 26 was no exception. Only this time it was not due to a massive accident, snowstorm or contentious land annexation. This time it was good news for Leduc and region. Very good news! With a line up of dignitaries consisting of Leduc County Mayor John Whaley, Leduc City Mayor Greg Krischke, MLA's George Rogers, Diana McQueen and Matt Jeneroux, and Alberta Minister of Transportation Ric McIver looking on, it was formerly announced that the Province had committed to $3,443,300.00 in GreenTRIP funding for Leduc. Pair that with $1,119,000.00 From Leduc City and $602,700.00 from Leduc County and this means $5.16 million dollars are going to be poured into Leduc's fledgling busing system. In a total enhancement of the current service the money is already slated to purchase five mini buses to go with the four full sized buses already in use, four park and ride lots will be created, and the route in Nisku will be expanded, as well as adding an airport run. In acknowledgment of the fact that this transit collaboration between the City and County is a first in the Province, Mayor Whaley said he was extremely thankful for the partnership in moving this project forward. He added the comment that hopefully this environmentally responsible transport will encourage more people to use the buses between Leduc and Edmonton and receive some of the congestion from the City into Nisku. Mayor Krischke was smiling widely as he stated that "This is a wonderful day for our region!" He went on to say that we need to continue to be good stewards of our environment and quoted statistics on the service that showed a jump from 3000 person trips in January of 2011 to over 5000 in January 2013. Minister McQueen spoke of how Leduc County municipalities have done an excellent job of hitting their targets on environmental concerns, but on a more personal level, how these buses will also change the life of seniors in the area. In a humorous start to his comments, Minister McIver donated $50.00 to Leduc's Food bank as a penalty for his cell phone ringing and interrupting the ceremonies, and he then commended Leduc City, County and regional municipalities for partnering together on this project. He spoke of how Premier Redford believes that municipalities can make smart decisions for themselves and the GreenTRIP buses in Leduc are a perfect example of that happening today. He stated that at the end of the day this is what taxpayers want to see their government doing; working together and making things happen. 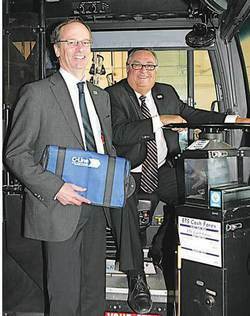 In later comments Mayor Krischke said that "We currently have a great service with the C-Line but it is limited. Now we will be able to enhance the entire service and this funding puts our destiny into our own hands!"